If you’re like me, you’re tired of searching for not-stick cookware every 3-years. Stainless Steel Pots and Pans are very expensive. Knowing that my cookware is going to get banged up, scratched and lose it’s protective non-stick coating after 2-3 years, I wouldn’t mind paying a little more to get a set of pots and pans that will hold up a little longer. Consider this review on Stainless Steel Pots and Pans a work in progress. I intend to continue to research what’s best for my needs in my own kitchen and update the content on the stainless steel pots and pans. There are some Teflon, and non-stick pans in this group, as I feel they do have some redeeming features, as well. For this review, I will be researching All Clad Cookware Sets, Calphalon Tri Ply Stainless, Bialetti, T-Fal, Mirro Cookeware and Kitchenaid Cookware. Pots and Pans have always been a sticky subject with me (excuse the pun). I want cookware that is not only durable and non-sticking, but convenient, easy to handle, cook with and clean. Let’s see how these brands of stainless steel pots and pans stack up against each other. 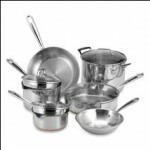 If All Clad Cookware sets look very expensive it is because – well, they are very expensive. You can expect to drop close to a grand for a 14-piece All Clad Cookware set. However, you can find the 10-piece sets for much, much cheaper, below. 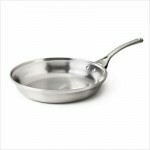 All Clad Cookware is made from shiny Stainless Steel with an aluminum layer in-between to help conduct heat. The advantages to All Clad stainless steel cookeware, or any stainless steel pots and pans for that matter, are beauty, durability and consistently even cooking temperatures. There are a few disadvantages to stainless steel besides the price tag. I’ve been told by some user of All-Clad Products that they don’t like having to use an oven mitt for the stainless steel lid handles. Because the aluminum middle layer conducts heat, the lids get darn hot! Touching the handle of the lid while it’s cooking is like touching the bottom of the hot pan! This doesn’t bother me too much because I quite often use a Cast Iron Pan to cook and am used to being careful with the handle. One of the other disadvantages of All Clad Cookware is that stainless steel takes a little more effort to clean. Supposedly there are some products out there to make cleaning easier. One final complaint, and for me, it’s a biggie: I absolutely cannot stand the rivets which fasten the handle on the inside of the cookware. We purchased a cheaper set of T-Fal last year that has these rivets. Food tends to stick on them and they are a real nuisance to clean. Is there not a better way to fasten the handle on such an expensive set of cookware? Besides the few complaints I’ve mentioned, All Clad Stainless Steel pots and pans are definitely on my recommended list for long term, beautiful cookware. Oh no, not another stainless steel pan with those annoying rivets on the inside! 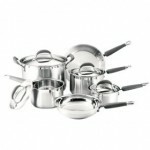 Calphalon Tri Ply Stainless is another quality, stainless steel cookware set with annoying little rivets on the inside. Note the picture to the right. 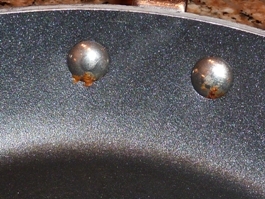 (This is not a Calphalon pan, but an example of the rivets that are on most cookware) The photo is to illustrate how Rivets on the our frying pans make it difficult to clean the pan without scrubbing. We don’t use the rivets to cook our food, so why do we have to have them on the inside of our cookware? Caphalon is actually quite similar to the All-Clad products, except it is less expensive, and maybe not quite as pretty. You can get a 10-14 piece of Calphalon Tri Ply Stainless cookware for $400-$500 – nearly half the price of the All-Clad. The advantages and disadvantages are very similar to the All-Clad, and they are made the same way, with the layer of aluminum between two layers of stainless steel. One thing in the Caphalon’s favor: The lids will not get too hot to handle! Of course, the other big advantage is the price. Calphalon is intended to be used as life-long cookware. Some users have reported discoloration on the inside of their pots and pains, but were easily able to clean it with hot sudsy water. Calphalon is advertised as dishwasher safe. From what I can see, the only advantage the All-Clad has over the Calphalon is strictly cosmetic. Calphalon, stupid rivets and all, is definitely on my ‘high-consideration’ list for my future set of stainless steel pots and pans. Based on the other two reviewed, this could be considered the poor man’s set of stainless steel cookware: Kitchen Aid Cookware is affordable, yet seems every bit as good and durable as the more expensive ones above. 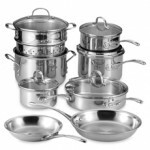 A Stainless Steel, 10-Piece set of Kitchen Aid Cookware is under $200.00. It looks nearly just as good as the All Clad or Calphalon. It feels heavy and well made and gives you that good, even cooking capability that is desirable in a stainless steel set of cookware. Many reviewers of the Kitchen Aid Cookware stainless steel set have recommended that you not use this cookware for stick-able foods like eggs and pancakes. Overall, I was hard-pressed to find someone who was not satisfied with the Kitchen Aid Cookware. It seems that the staining problem can be solved with a little vinegar. Obviously, a good set of stainless steel cookware does not replace the need for a good non-sticking, egg or omelet skillet. Once again, I was disappointed to learn that I will still have to put up with the rivets on the inside of the pan. The big advantage to this excellent, life-long lasting Kitchen Aid Cookware seems to be consistent and even heat for cooking. For $200, you can afford to have a couple of non-stick skillets to supplement this durable, lasting stainless steel set of cookware. One other thing that might make you feel even better about an investment in Kitchen Aid Cookware is that it comes very highly rated by Consumer Reports. I vote Kitchen Aid Stainless Steel Cookware the hands down winner in this group of Stainless Steel Cookware.